It wouldn't let me edit the other upload, alas, so I'll just have to post this separately. I forgot to include the .gen file in the other .zip. So here it is, with the .gno file as well so the captions don't go out on you. The Pigment and Bleed genes are set on random color settings so if you use this you'll want to tweak those to your liking. (The shown Norn is from one of my breeding colonies rather than a gen 1 but she's too pretty not to use as the face for the breed on this upload. ) In the future I'll remember to include this stuff in the main breed's .zip file. 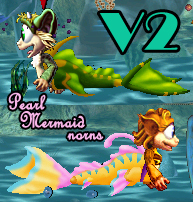 The new Abyss Dragons use the sprites of the original Draconian Norns and the Gargoyle Norns. Both must be installed for the Abysses to look right. While not yet perfect (I doubt I'll ever consider them such since there will always be something else to tinker with), these guys are now good enough to release, I think. Let me know if you encounter any serious (or even not-so-serious) issues with them, please! The only major problem I know of right now is that the Artemia Sea metaroom tends to be too hot for them. Using the Heater on its chilling settings might help, but I haven't actually tried it. Otherwise, they do great in the Hydro Nornterrarium, the Deep Abyss (of course), and the updated Aquanornia. I haven't gotten any other aquatic metarooms to work on this machine yet but I'm sure they'll do fine anywhere there is a sufficient quantity of prey and the temperatures aren't too extreme (though they deal better with excess cold than excess heat as a rule) - this includes terrestrial rooms. I have done much less terrestrial testing of them, but they frequently use the upper parts of the Aquanornia room and they seemed to do fine in Veridia the few times I raised them there, so you don't need to keep them in water at all if you don't want to. As the title notes, this is a TWB version of the breed. I plan to do a CFF version as well to avoid the temperature-related issues, but I wanted both available and the TWB version is the more "true to concept" one anyway. So I did it first. There is a text file with some care/feeding information in the .zip, and a WHOLE lot of export files representing various genetic colors. Some look rather similar but are still genetically different. There is one male and one female for each genetic color (which often look very different thanks to the differences in the underlying sprites). I recommend keeping them in groups of no fewer than four individuals, as they are highly social and get lonely more easily than normal. Also, do not be alarmed by fighting - they are tough and will not kill each other except in the most extreme circumstances (none of mine have ever killed each other but it's theoretically possible). Please do not cross-breed or splice Abyss Dragons with other breeds (including version one Abysses) unless you are willing to deal with a lot of stillborns, sliders, and other totally nonviable offspring. They have new organs, deleted genes, and otherwise will not cross well with others. Abyss Dragons are a variant of Amphibious Draconians with a variety of alterations, mostly fairly minor in themselves, but which add up to quite a different-behaving Norn. As their name suggests, I particularly like them in the Deep Abyss metaroom. They look incredible there - almost subtly bioluminescent sometimes against the dark background. However, they will work fine in just about any metaroom so long as you provide an adequate supply of edible critters, pests, and bugs, since they are fully amphibious. A list of the various ways the Abyss Dragons have been changed is included in a .text document in the .zip file (sorry the picture is so dark, but I had a hard time getting a good image showing both a male and a female. The more truly blue one with a greenish tint is male, the one that looks sort of brown or gold as well as blue is the female; the color differences are due to the underlying sprites of the Draconian Norns). IMPORTANT! This breed requires the Draconian Norns to be installed to look right! By request, here are the agent files I used to create the original A-name/Gen1 Grendeltails, the ancestors of all the later ones. Note that although color options are included, they vary in more than just color. Also note that they are not remotely colortrue. :p More information is included in a text file in the .zip. The Pegasus Ettins have small wings, a unicorn horn on their head and a modified Canny genome. The Pegasus Norns are made by Angela Allan (sprites) and Nornboy (genome). Their sprites are based on the Emerald Norns. They are somewhat smaller than normal Norns, have small wings, a unicorn horn on their head and have wild hairstyles. Idea based upon the original Coffee Norns, These creatures will never feel tired or sleepy; great for anyone wanting to study the effects of sleep deprivation on the improved CFE/CFF brain structure. Somewhere in-between Albia and a colorful village, these Norns were found. They are essentially a recreation of the variant-based Creatures Village genome (spare a few quirks), built on the CFF genome. They are also (sort of) colortrue, so breed/splice away! Just a few issues, though: unlike most CFF norns, they don't have any sense of fullness and don't get any particular drawbacks for it; certain Norns may become quite slap happy; and because of their CV roots, they're practically immortal! The only way you can kill them off is by injecting them with a fatal toxin once they become Ancient... or you can just throw them out the airlock. They use the Zebra and Fallow Norn sprites. Here's some Sea Ettins, built off of the CFF genome for the default C3 Ettin. Incredibly exciting, I know. ...Though, I sort of did my own things with it. Like the original breed, they're amphibious. But now they should swim (with the Swimmeragent), hoard gadgets to cure boredom less often, and generally be livelier than normal Ettins. You'll obviously need the original breed installed. Merry Christmas Creatures Caves, my gift to you all is a new genetic breed! The Thistlerfern Norns were built upon the TWB genome. As babies several of their body systems begin dormant, but placing them on moist soil will cause them to start growing. From this point on all they will need to survive is water, heat, light and soil nutrients, just like any other plant. This does not mean that Thistleferns cannot eat, they will gain all the same nutritional benefits from food as any other creature, and often do so just for fun. However, if a Thistlefern were to become hungry it's instincts will tell it to approach any nearby plants which should hopefully be growing in a good place to photosynthesize. These creatures use Toxic Norn and Plant Norn sprites. Story included. A true warmblood version of the Mountain Norns and of the Wood Norns. The zip file contains their updated genomes. Both breeds are available at the CCSF 2015. Released for the CCSF 2015, these animal-loving norns closely resemble Treehugger Norns. However, these Norns are surprisingly tough and have heaps of stamina, unlike their fragile Treehugger cousins. Wood Norns also get bored easily, so make sure you provide them with plenty of critters and toys to play with! This pack contains the TWB conversions of the Bondi, Hardman, Toxic and Treehugger Norns. TWBs are creatures with real internal body temperatures who are effected by the heat levels of their environment, the types of food they chose to eat and the amount of activity in their lifestyles.